Loutra beach (i.e. Baths) is located 69km south of Heraklion and approximately 4km east of Lentas. Loutra is a quite unorganized beach with rocky seabed, ideal for snorkeling, fishing and camping. The beach is protected from the cape of Trafoulas, where the small fishing port of Lentas is built. There is a hotel and few restaurants nearby. 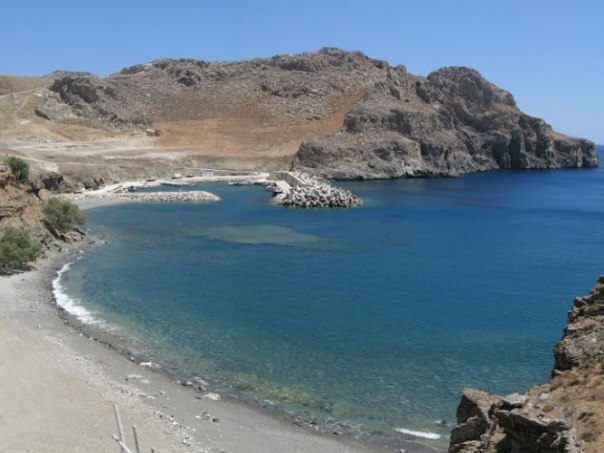 It is worth noting that the small beach was a famous destination to nudists, however, today they no longer prefer the beach due the newly built port of Lentas. Near the quiet beach you will find the wonderful church of Panagia, built inside a rock. Access from Heraklion is possible only by rented or private cars and motorbikes. If you choose to drive from Heraklion, take the provincial road Herakliou-Phaistou to the south. Drive past Agioi Deka, Vagonia, Vasiliki and Krotos villages and follow the dirt road to the south. If you choose to drive from Lentas, there is an easy dirt road to the east, leading to Loutra beach.